Last Thursday saw the delivery of 22 wifi-iPads into the hands of excited Education students. Believe me, they were excited — with the experience more akin to Christmas than a university device trial. The session was not quite what I expected, in short it was absolute bedlam! The spectrum of ability with the device ranged from experts to those who had never used one, had not much experience with Apple products and didn’t have an iTunes account right through to those students who brought their own iPads! At one extreme I had students who whooped, ripped the plastic off the devices and had run through the setup and was downloading apps while I was still handing the last device out. At the other end of the spectrum, I went step by step through setting up the iPad, and in several cases, guided students through the process of getting an Apple ID. It was definitely a good lesson for me. I’m a qualified trainer, but I have never had to work with such a wide range of technical abilities before. Students have usually come to me with a good grounding in computing and an aptitude for technology. It will be interesting watching how the class manages with the exercises that have been designed specifically for the use of the iPad. All of these students know how to use a pen and paper, but the iPad may pose a challenge in thinking and doing for some of the less technically savvy ones. Overall the class went well, although we ran out of time to show them how to use the primary app that the lecturer and I had selected for them. In the end I was left uncertain about how prepared they’d be for the next assignment which would be prepared exclusively on the iPad. I have some thinking to do about how much the new technology will impact their ability to get through the subject material in the time available, but that is a discussion for another week. Categories: iPad Trials | Permalink. Hello, my name is Tyswan, and I’m one of the new Graphic and User Interface designers on the project. In the coming months I’ll be doing some work on ePub formats, student instructional materials and supporting the Bathurst device trials. You can read all about me on the Team page. Let me start off by saying that I didn’t accept this job because of all the cool iOS and mac toys I’d get to play with… but I’m definitely not complaining! With the device trials starting up at the beginning of the session I have had 21 shiny wifi iPads and cases land on my desk, along with a very slick macbook air. I have already set up three of the iPads, and lent two of them out to the academics in the School of Education who will be running the Bathurst device trials. Another 63 iPads with cases have arrived in Wagga. I probably shouldn’t admit how much of a learning curve it’s been for me as I have never owned an iPad (and have only just bought an iPhone), and I’ve had to quickly become familiar with wireless settings, synching with iTunes, storing documents in the cloud and the plethora of apps out there, not to mention writing with my finger. Fortunately my experiences mirror many of the issues that the students involved in the trial will face as they get used to a (possibly) new way of working in a predominately electronic space. The next step is to look at how the iPads will be used in the specific courses. Here at Bathurst, we are currently now assessing a range of apps that will be used in a multi-modal writing course. I’ve learnt very quickly that although there are plenty of apps out there, each is designed with a slightly different focus, and the real work is looking at integration of the apps, and designing how they will work together to meet the teaching needs of the lecturers, rather than a straight out comparison of features. I love the lateral thinking that is required to see what the lecturers are trying to achieve and then finding the software, apps and processes that can help them to make the learning experience as fun and seamless as possible. 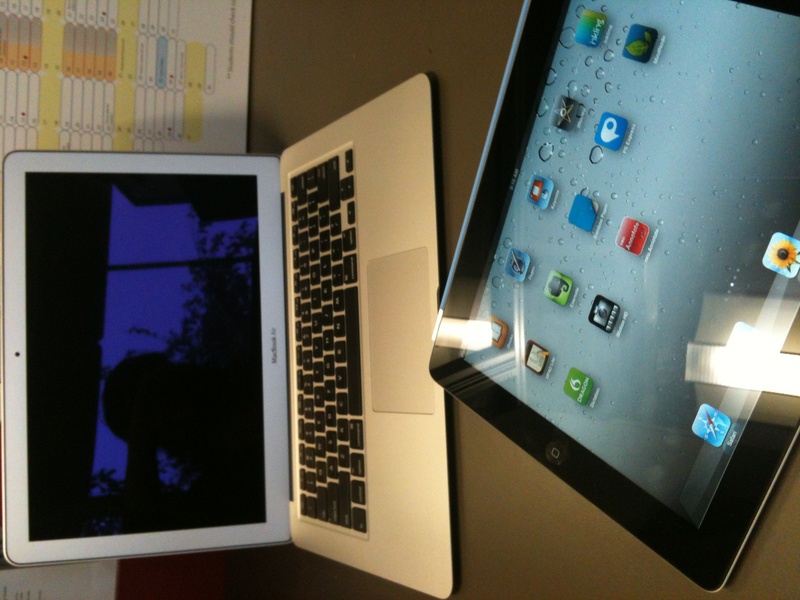 And if playing with a shiny new iPad all day is part of my job, then so much the better! Categories: iPad, iPad Trials | Tags: educational technology, ipad, mDev, staff | Permalink.